This month’s masterpiece from Hadrian’s Villa is a series of heavily restored mosaic panels depicting bucolic scenes with animals. The first panel depicts a rocky landscape with a flock of goats peacefully grazing by a stream. A standing bronze statue dressed in a long tunic is standing on a rock. It holds a bunch of grapes in its right hand and a thyrsus in his left hand. The statue is probably an image of the god Dionysos meant to evoke a sacro-idyllic landscape. Dionysus was also considered to be a god of fertility and there seems to be a human phallus represented on the tablet next to the statue. The phallus was a symbol of his power, the ability to create new life. Mosaic panel depicting a rocky landscape with goats by a stream and a standing statue of Dionysus. Image © Carole Raddato. The second mosaic panel is very similar. 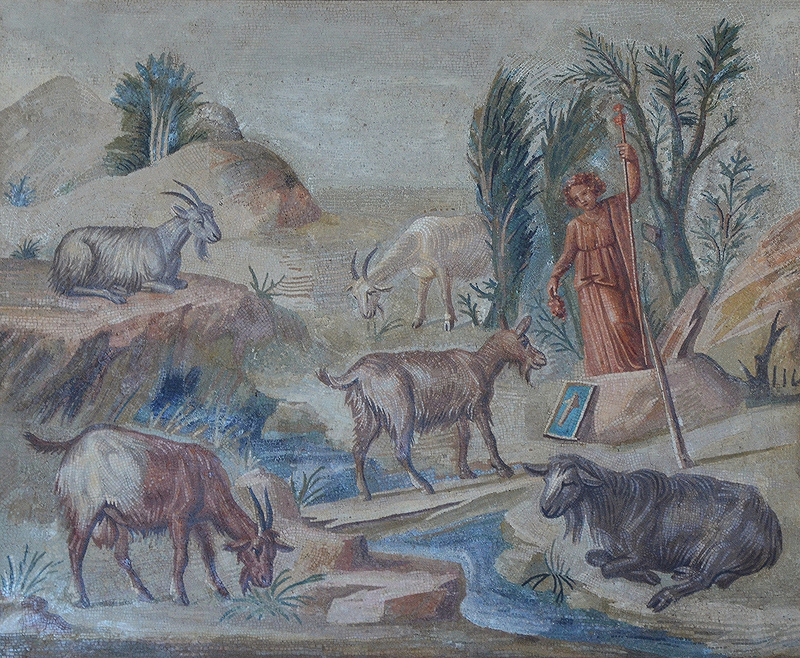 It also depicts a group of five goats by a stream but the figure of the god is seated in a rustic sanctuary. 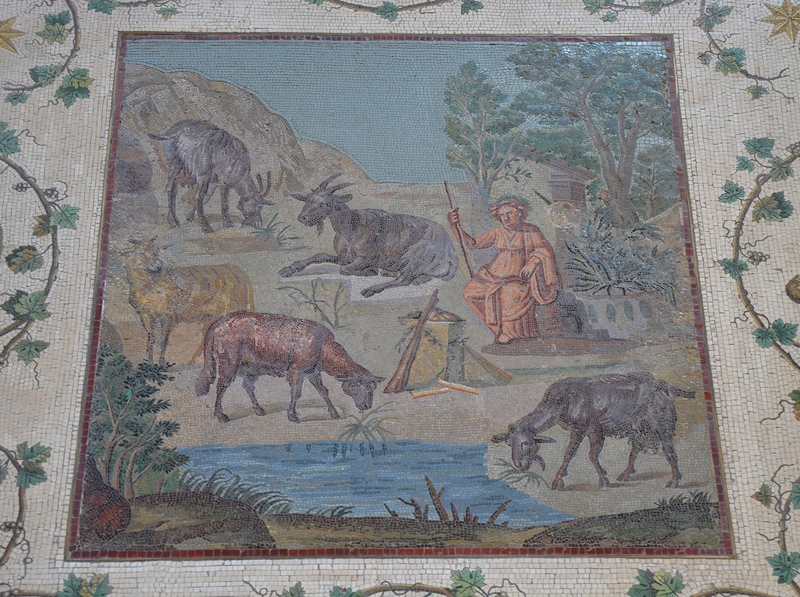 Mosaic panel depicting a rocky landscape with goats by a stream and a seated statue of Dionysus. Image © Carole Raddato. 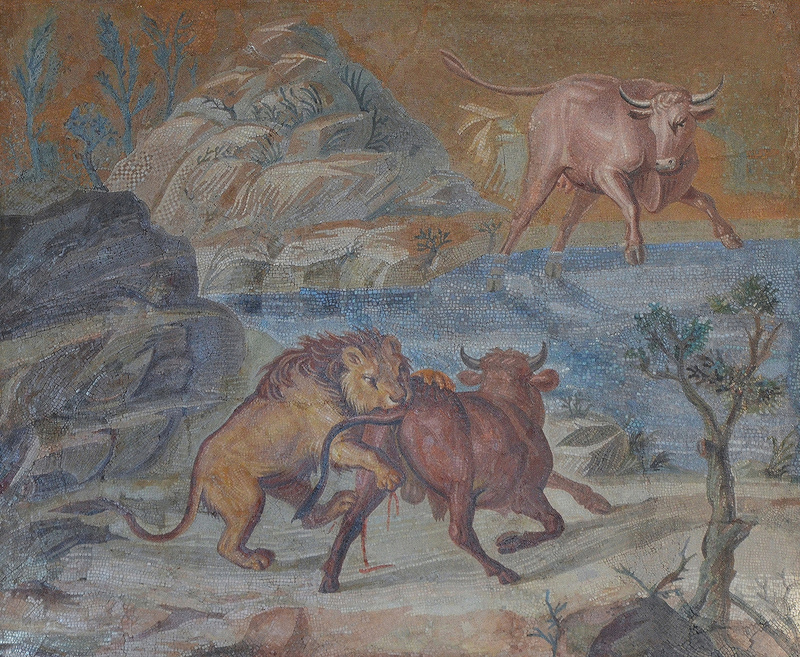 The third panel features a lion attacking a wild bull while another bull looks on with fear. Mosaic depicting a rocky landscape with a lion attacking bull. Image © Carole Raddato. These panels formed part of the floor decoration of a building in the Imperial Palace complex known today as the Sala a Tre Navate (Hall with Three Aisles). It belongs to the second phase of construction (125 – 134 AD) of the Villa. 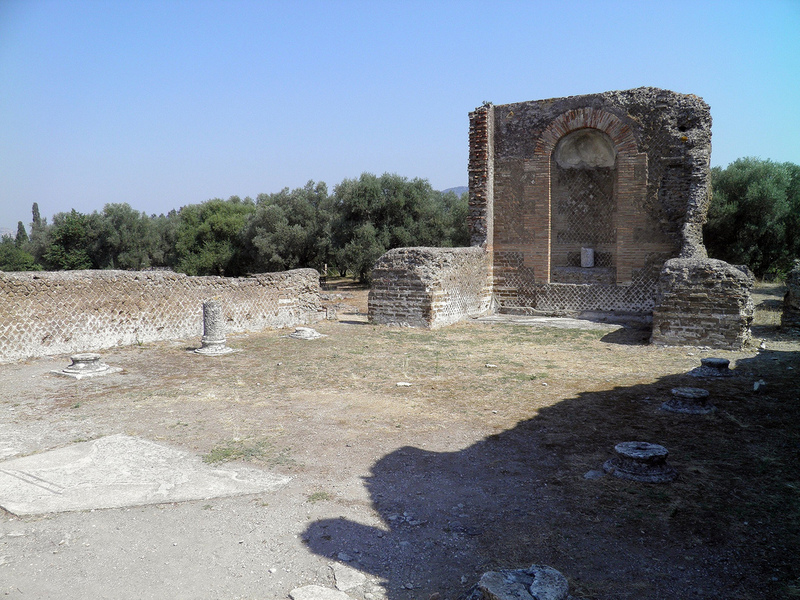 The building consisted of a vestibule that led to a triclinium with two rows of columns and a small rectangular niche. This type of room was called “oecus corinthius” by Vitruvius. It was a kind of colonnade with a vaulted ceiling in the central part and a smooth ceiling over the external ambulatory. Sala a Tre Navate (Hall of Three Aisles), Imperial Palace complex. Image © Carole Raddato. Pair of Centaurs Fighting Wild Cats Mosaic from Hadrian’s Villa, c. 130 AD. Image © Carole Raddato. 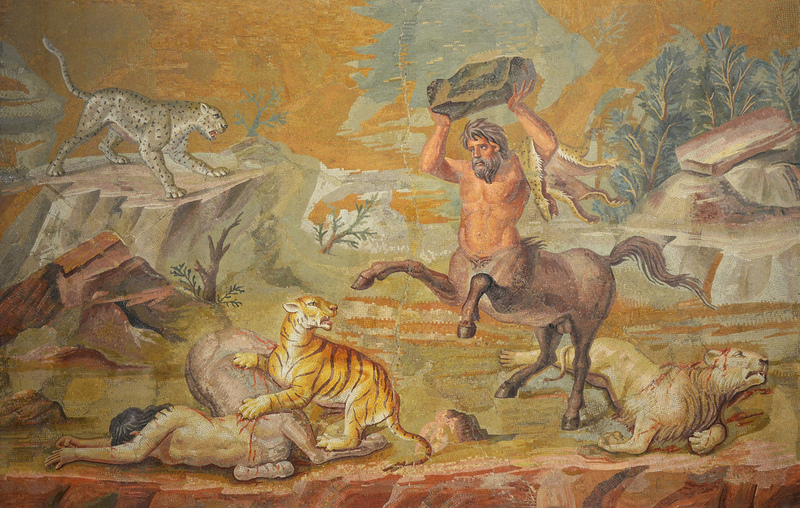 Today the Centaur mosaic is in the Altes Museum in Berlin while the others are in the Musei Vaticani in Rome, in the rooms Gabinetto delle Maschere (Cabinet of Masks) and Sala degni Animali (Halls of the Animals).